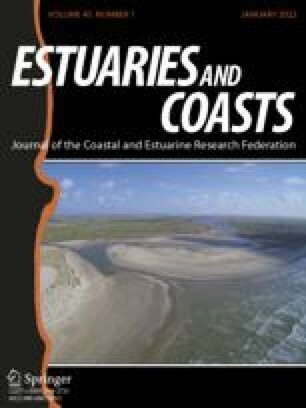 To determine the removal of regenerated nitrogen by estuarine sediments, we compared sediment N2 fluxes to the stoichiometry of nutrient and O2 fluxes in cores collected in the Childs River, Cape Cod, Massachusetts. The difference between the annual PO4 3− (0.2 mol P m−2 yr−1) and NH4 + (1.6 mol N m−2 yr−1) flux and the Redfield N∶P ratio of 16 suggested an annual deficit of 1.5 mol N m−2 yr−1. Denitrification predicted from O2∶NH4 + flux ratios and measured as N2 flux suggested a nitrogen sink of roughly the same magnitude (1.4 mol N m−2 yr−1). Denitrification accounted for low N∶P ratios of benthic flux and removed 32–37% of nitrogen inputs entering the relatively highly nutrient loaded Childs River, despite a relatively brief residence time for freshwater in this system. Uptake of bottom water nitrate could only supply a fraction of the observed N2 flux. Removal of regenerated nitrogen by denitrification in this system appears to vary seasonally. Denitrification efficiency was inversely correlated with oxygen and ammonium flux and was lowest in summer. We investigated the effect of organic matter on denitrification by simulating phytoplankton deposition to cores incubated in the lab and by deploying chambers on bare and macroaglae covered sediments in the field. Organic matter addition to sediments increased N2 flux and did not alter denitrification efficiency. Increased N2 flux co-varied with O2 and NH4 + fluxes. N2 flux (261±60 μmol m−2 h−1) was lower in chambers deployed on macroalgal beds than deployed on bare sediments (458±70 μmol m−2 h−1), and O2 uptake rate was higher in chambers deployed on macroalgal beds (14.6±2.2 mmol m−2 h−1) than on bare sediments (9.6±1.5 mmol m−2 h−1). Macroalgal cover, which can retain nitrogen in the system, is a link between nutrient loading and denitrification. Decreased denitrification due to increasing macroalgal cover could create a positive feedback because decreasing denitrification would increase nitrogen availability and could increase macroalgae cover.